Though "The Tomb" was the first story by H.P. Lovecraft I ever read, it was actually another story from the same anthology I borrowed from the library that conjures up the strongest memories. 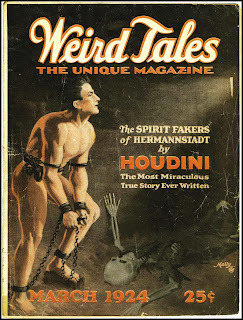 "The Rats in the Walls" first appeared in the March 1924 issue of Weird Tales and represents a "bridge" between his earlier Gothic-inspired narratives and his later Cthulhu Mythos ones. Here, Lovecraft joins stock Gothic features, like an ancient castle and fearful legends about the protagonist's ancestors, to more "modern" ideas, like evolution (and the possibility of its reversal), to lay the groundwork for so much of his later fiction. It's worth noting, too, that "The Rats in the Walls" is one of the first tales in which HPL specifies a roughly contemporaneous date for its events, thereby grounding it in "reality" rather than leaving it in some nebulous "otherwhen" like so many of his earliest efforts. The story is a first person account by a Virginian named simply Delapore (we never learn his first name) of the events that occurred after he moved to England to take up residence at his family's ancient demesne, about which there were unsavory legends. On 16 July 1923, I moved into Exham Priory after the last workman had finished his labours. The restoration had been a stupendous task, for little had remained of the deserted pile but a shell-like ruin; yet because it had been the seat of my ancestors, I let no expense deter me. The place had not been inhabited since the reign of James the First, when a tragedy of intensely hideous, though largely unexplained, nature had struck down the master, five of his children, and several servants; and driven forth under a cloud of suspicion and terror the third son, my lineal progenitor and the only survivor of the abhorred line. With this sole heir denounced as a murderer, the estate had reverted to the crown, nor had the accused man made any attempt to exculpate himself or regain his property. Shaken by some horror greater than that of conscience or the law, and expressing only a frantic wish to exclude the ancient edifice from his sight and memory, Walter de la Poer, eleventh Baron Exham, fled to Virginia and there founded the family which by the next century had become known as Delapore. Once he moves into Exham Priory, Delapore -- or de la Poer, as he starts to call himself, after the fashion of his forebears -- discovers that the locals hold him in suspicion, on account of his ancestors. This leads him, with the assistance of a friend, Edward Norrys, to look more deeply into the history of the Priory and the de la Poer family. Likewise was it said that the rites did not vanish with the Roman power, and that certain among the Saxons added to what remained of the temple, and gave it the essential outline it subsequently preserved, making it the centre of a cult feared through half the heptarchy. About 1000 A.D. the place is mentioned in a chronicle as being a substantial stone priory housing a strange and powerful monastic order and surrounded by extensive gardens which needed no walls to exclude a frightened populace. It was never destroyed by the Danes, though after the Norman Conquest it must have declined tremendously, since there was no impediment when Henry the Third granted the site to my ancestor, Gilbert de la Poer, First Baron Exham, in 1261. Of my family before this date there is no evil report, but something strange must have happened then. In one chronicle there is a reference to a de la Poer as "cursed of God in 1307", whilst village legendry had nothing but evil and frantic fear to tell of the castle that went up on the foundations of the old temple and priory. The fireside tales were of the most grisly description, all the ghastlier because of their frightened reticence and cloudy evasiveness. They represented my ancestors as a race of hereditary daemons beside whom Gilles de Retz and the Marquis de Sade would seem the veriest tyros, and hinted whisperingly at their responsibility for the occasional disappearances of villagers through several generations. Finding out these and other facts only encourages de la Poer to delve further, as he is becoming near-obsessed with the mysteries of Exham Priory and, more immediately, his own family. It's around this time that the narrator begins to hear the "low, distinct scurrying, as of rats" behind the walls of his new home, even though neither he nor anyone else can find any signs of rodents in the Priory. Paying careful attention to the movements of these supposed rats, de la Poer concludes that they "were engaged in one stupendous migration from inconceivable heights to some depth conceivably or inconceivably below," which leads him into the cellars beneath Exham Priory, where he discovers Latin graffiti mentioning ancient deities even more sinister than Cybele. Nevertheless, he presses on, precipitating a revelation that brings the story to its fateful conclusion. Though "The Rats in the Walls" is far from Lovecraft's greatest work of fiction, it's still very enjoyable, having the virtues of being both short in length and direct in its presentation. It's also, as I noted, something of a bridge between his early work and his later output, which makes it a very good introduction to Lovecraft for those unfamiliar with his writings and themes. The story occupies a fond place in my memories because, when I had exhausted all the Lovecraft books I could find at my local library, my father took me down to the Central Library on Cathedral Street in downtown Baltimore, to look for more. Not only did I find many more books by and about HPL, but I also discovered a recording of David McCallum reading "The Rats in the Walls," to which I listened several times before having to return it to the library. It's one of the few Lovecraft stories I've ever heard read aloud, which may be why it has stayed in my imagination for so long. First HPL story I read and still one of my favorites. I've always loved this story, especially because of the prominent role of de la Poer's cat. I just wish it had a different name. It's Lovecraft's unfortunate choice in racist nomenclature that that cat's name is the first thing that immediately comes to mind whenever the story is mentioned. It's unfortunate because I rather like the rest of the story. I actually think it is a very good name for the cat as a symbol of the essence of de la Poer's doom. Racism - incl. losing one's race, the annihilation of race as a general concept, etc. - is a critical element of Lovecraft's "loneliness horror," we just fancy ourselves too polite to thing such things today. But the fact is very evident that the fears that Lovecraft "predicted" in his fiction - an increase in what he would describe as animalism, a religious-fervored anarchy, and violent racial turmoil due to culture clash - very much have come to pass. Now, what scared Lovecraft may not be frightening to you, but I don't know how one can enjoy Lovecraft, yet wish his racism wasn't there. Racism, eugenics and Darwinism, for good or bad, gives almost every last one of his stories their essence. Lovecraft was a staunch racist - an outspoken racist, an author of overtly racist poetry and an opponent of mass immigration on racial grounds. It is infused in almost every story he wrote, and wishing the racist bits of Lovecraft away is wishing Lovecraft himself away. But the whole story centers around the horror of Lovecrafts peculiar racial anxiety. I don't understand how racist names are unacceptable but a story whose theme is expressly racist is "likable." It is the story's unlikable horror that draws me to it, or maybe I don't understand horror stories anymore. HPL had a cat of the same name when he was young. Makes sense, as this is one of the best of his work for campfire retelling. Anyway that was not what I wanted to say, what I wanted to say is that this was the first ever HPL story i read and I loved it for all its peculiarity and little oddities. I was so hooked by the story that I literally felt my chest constrict when De La Poer went deeper and deeper into the earth and with the revelations the story brings forth (didn't want to add spoilers for those who might not have read it). I know I read it as part of an omnibus but I can't for the life of me remember any of the other stories in that volume. It's one of the very few stories I've read more than twice and I've loved since my early teens and I love it still, nearly twenty years later. I might be missing something, but if the story was published in Weird Tales in 1924, how did it spark a 1923 (and further) conversation with Robert E. Howard? By means of a typo on my part. This is one of my favorite Lovecraft stories, simply because my namesake gets devoured. I have not words to describe the impression this tale had in me many years ago, when I was a teenager and belived that a horror story was gore and a cheerleader screaming. It was my first Lovecraft tale, of course. I love this story. I think it was the first Lovecraft I'd ever read. Still plan to one day have the De la Poers figure in a CoC game, should I ever run one. The cat's name was a common one at the time among black furred pets, though I've seen it used more with dogs than cats. It is less a racism issue with Lovecraft than dating the story as coming from a much less sensitive time. I think HPL was quite racist, this just isn't one of the best pieces of evidence of it (check Herbert West Reanimator for a strong one). M.R. James' ghost stories are generally better read-alouds than HPL's work. You can find some (grainy quality copies) of Christopher Lee reading James on Youtube. Christopher Lee can make a shopping list sound creepy. Don't get me wrong, I still thoroughly enjoy the story and its themes, the damn name still distracts me...it *works. * The whole story's unsettling to me and that is why I like it. There's a great reading of The Rats in the Walls in one of the volumes of audio readings called "The Dark Worlds of H.P.Lovecraft". I believe there are 6 volumes covering 15 stories. The reader, Wayne June, is fantastic on all the stories. I'm not sure if they're still available to buy new, but (I hope I'm not breaking a site rule by writing this) they are pretty commonly available through not-so-legal means. And incidentally, in this audio version the cat's name is change to Mr. Blackman.